Launched two years ago as the world's first research unit of its kind established inside a health system, the Penn Medicine Nudge Unit's unique achievements are the subject of a New England Journal of Medicine Perspective article. 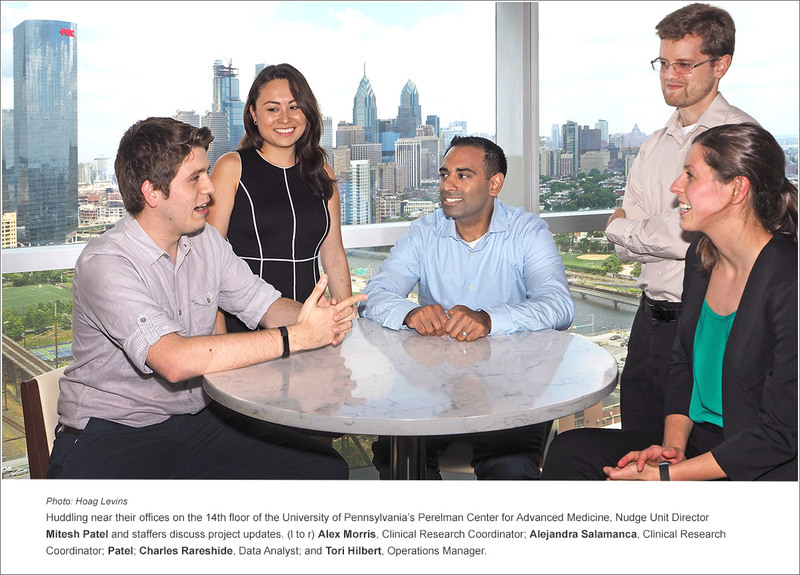 A collaborative initiative of Penn Medicine, its Center for Health Care Innovation (CHCI) and the Center for Health Incentives and Behavioral Economics (CHIBE), the Nudge Unit is directed by Mitesh Patel. It has more than 30 active research projects, ten staffers, and is recruiting additional personnel. Authored by Penn Medicine's Patel, Kevin Volpp and David Asch, the NEJM Perspective piece details the Nudge Unit's logistics and operational lessons to date and discusses the importance of such internal research capabilities in an age when health care delivery is being so dramatically changed by digital technologies. "The digital revolution has been a two-sided coin," said Patel in an interview with LDI. "On one side, the adoption of electronic health records has witnessed a tremendous ramping up. A decade ago, only one in ten physicians used EHRs. Now, nine out of ten do. Most of the focus over that period has been simply on getting people to USE the new systems; and there's been relatively little testing of how digital choice architecture is designed. On the other side of the coin, this gives us a tremendous opportunity to measure what happens when we vary choice architectures to influence the behavior of clinicians and patients." All three authors are senior fellows at Penn's Leonard Davis Institute of Health Economics (LDI) and deeply engaged in the world of behavioral insights research. Aside from being the Nudge Unit Director, Patel, MD, MBA, is both an Assistant Professor at Penn's Perelman School of Medicine, and the Wharton School, and a primary care physician at Philadelphia's Crescenz VA Medical Center. Volpp, MD, PhD, is a Penn professor and Director of CHIBE and Asch, MD, MBA, is a Penn professor and Executive Director of CHCI. When (the brand/generic) prescription defaults were changed, it required only a minor modification to the order entry system. It took very little effort, but will probably save millions of dollars over the next few years for patients, insurers and the health system. "For example, airlines require consumers to actively choose whether to purchase trip insurance before they can buy a plane ticket. Amazon displays additional, complementary items alongside the purchase you are about to make. Netflix changed default settings to automatically play the next episode in a TV series to encourage binge watching. Similar opportunities exist to direct clinicians and patients toward better health care in situations where there's consensus about desired behaviors." A Patel-led study wrapped up in 2016 when he was also organizing the launch of the Nudge Unit demonstrated how slight adjustments in hospitals' EHR systems can have dramatic effects. Conducted inside the University of Pennsylvania Health System EHR system, the investigation focused on physician drug prescribing default settings that, in many cases, favored the selection of brand-name drugs. At that time, the overall prescribing rate for generics was 75.3%. The health system changed the default in a manner that made selection of generics more automatic, and over a ten month test period, the generic prescribing rate went up to 98.4%. Patel emphasized that the costs involved in Nudge Unit projects can be relatively small. "Many of these things can be very low cost," he said. "For example, when prescription defaults were changed, it required only a minor modification to the order entry system. It took very little effort, but will probably save millions of dollars over the next few years for patients, insurers and the health system." During the last decade, national government agencies in the U.S. and elsewhere established nudge units to better inform management practices and public policy. Some of the earliest uses of nudge tactics for health-related interventions involved medication adherence, obesity and smoking cessation programs, driver license opt-ins for organ donations, the redesign of school cafeteria practices to encourage the eating of less junk food, and other consumer-related activities. What makes the Penn Medicine Nudge Unit so different is that it focuses on the internal infrastructure, processes and medical practices of a sprawling big city health system with an eye to improving financial and clinical outcomes. It is studying doctors and nurses and the systems that support and define their hour-to-hour practice behaviors. Patel admits one challenge in such work is that many clinicians are resistant to change and the concept of being "nudged." "What's interesting," he said, "is that we often don't realize that we are already being nudged by the design and choice architecture of whatever electronic health record system we are using. It influences our choices every day, but often this is overlooked. The Nudge Unit has been able to demonstrate that in many of our initial studies -- such as how changing defaults influenced generic prescribing." Patel identified internal politics as an issue a health system Nudge Unit must carefully address as it attempts to identify and subject potential infrastructure variables to behavioral insight testing. "Collective agreement within a group of clinicians and leadership is often a challenge because many tests and treatments are evolving and patients may vary in their response," he explained. "Another important area is working with information technology (IT) to implement interventions in a testable way and, if they work, scale them throughout the health system," Patel said. To address this potential challenge, his team invited top Penn Medicine IT executives to join the Unit's steering committee. This includes Christine VanZandbergen, PA-C, MPH, MS, Associate Vice President of Information Systems Applications and C. William Hanson III, MD, Chief Medical Information Officer. The Committee also includes leadership from clinical care, innovation and behavioral economics. To date, the dissemination of the Nudge Unit's work is attracting the attention of other health systems interested in exploring how a similar unit might work in their own facilities. "We're hearing from health system leadership across the country who want to both work with us and replicate our model at their institution," said Patel. In November 2017, a Nudge Unit proposal to evaluate two potential ways to reduce ER physician opioid prescribing in another large health system won a $600,000 grant from the Donaghue Foundation. That project will involve more than 50 emergency departments and urgent care centers affiliated with 24 hospitals operated by the Sutter Health System in Northern California. "This really begins to expand the work we're doing beyond Penn and into another health systems," said Patel. "We're hoping the NEJM article also helps catalyze that effort. Nudge units can have a tremendous impact on health care delivery, which means it can improve patient care and outcomes." The "nudge" concept is a health services research strategy that seeks behavioral insights that can be used to gently guide people toward healthier or different behaviors without eliminating other potential choices. Widely acknowledged as the intellectual father of the field is University of Chicago economist Richard Thaler, PhD, who won the 2017 Nobel Prize in Economic Science for work detailed in his papers and various books, the most famous of which is Nudge: Improving Decisions About Health, Wealth, and Happiness. Study Found That Rewarding Employee Wellness Efforts With Discounted Insurance Rates "Is Not Effective"